There has been an alarming rise in the incidence of allergic disease in recent years. 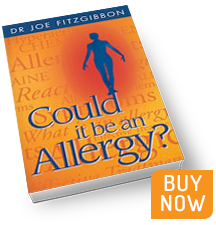 So much so that 40 per cent of the world’s population are now thought to have at least one allergy. The most common manifestations of allergy are rhinitis (including hay fever), sinusitis, conjunctivitis, asthma, eczema, urticaria (hives), and anaphylaxis (to food, drugs, and insects). Other conditions, including irritable bowel syndrome, migraine, ADHD, and fatigue are sometimes made worse by food intolerance. There is a world of difference between allergy and intolerance. One major difference is that allergy will show up on simple tests but intolerance will not. Food intolerance is best diagnosed by exclusion diet and challenge. How do we diagnose allergy? The most reliable and convenient diagnostic test for allergy is the skin prick test. This involves a series of tiny pin pricks to the skin of the forearm. Each pin is soaked in a different allergen. The skin is gently scratched to a depth of just 1mm. The immune system then begins to interact with the allergen and if you are allergic to the allergen you will produce a small itchy hive at the site of the pin prick. The is called a wheal. Wheals are visible to the naked eye and can be measured with a ruler. If you are not allergic to the allergen, nothing happens. You will need to resist the urge to scratch the test site as this could make interpretation difficult. The test is read after 15 to 20 minutes. What allergies do we test for? It is possible to be allergic to anything under the sun, including the sun. It would be impractical to test for everything, but we can check you for all important allergens. For example, when it comes to food allergy, the standard screening test includes the 11 foods that account for 98 per cent of all food reactions in the Western diet. These are hen’s egg, cow’s milk, wheat, soy, peanut, cod, prawn, Brazil nut, sesame, mustard, and celery. If you are particularly interested in a food that is not on this list we can often include that too. Similarly, when it comes to airborne allergen we test for representative pollens (grass, weed and tree), house dust mites, mould (e.g., Alternaria), and common animals. The test includes a positive control: one of the pins is soaked with histamine and this should produce a wheal in everyone. This gives confidence that a given test is valid on the day. If the positive control fails to produce a wheal then something is interfering with the test. The most common cause of a ‘negative’ positive control is recent antihistamine use, but other prescription drugs may also interfere. For this reason it is preferable to avoid antihistamines for five days prior to the allergy test. Wheal sizes are measured in millimetres, with 3 mm and above being considered a positive result. However, wheals smaller than 3 mm may suggest allergy in young babies. Interpretation of the allergy test is quite straight forward. If you are allergic to something you will produce a wheal at the site of the pin prick within 20 minutes; if you are not allergic nothing will happen. However, all diagnostic tests have limitations and allergy tests are no exception. In the first place, it is possible to get a ‘false negative’. This is where the test suggests you are not allergic to something when in fact you are. A negative test must therefore be confirmed by appropriate clinical challenge. For example, if your history suggests allergic rhinitis (nasal allergy) but your skin prick tests are negative, then a Nasal Provocation Test may be performed. In this test, allergen is placed in the nose and the local reaction is observed. A response of sneezing, congestion, runny nose and itch would all suggest allergy (in which case you have Local Allergic Rhinitis). Similarly, if you thought you were allergic to peanuts and the test came back as ‘negative’ then your next step would be to eat peanut under supervision in the Allergy Clinic. It is equally possible to get a ‘false positive’ result. In this case the test suggests you are allergic to something when in fact you are not. These false positives may represent latent allergy: the immune system recognises the allergen but does not react to it, and may never react to it. Sometimes every single pin prick produces a wheal and looks ‘positive’. This may give the appearance you are allergic to everything on the test but you are not, you simply have a condition called dermatographism; in which very sensitive skin reacts to the pin prick, not the allergen. Some allergens may produce a delayed reaction 24-48 hours after the test. These do not indicate allergy and are nothing to worry about. Blood tests that measure specific IgE, the allergy antibody, are available. These provide reliable information on sensitisation. The same precautions are required when it comes to interpreting positive or negative results. The main disadvantage are cost (each allergen being charged separately) and time (you have to wait a week or two for results). Ultimately, the gold standard test for whether you are allergic to a food is to take it and see what happens! An oral challenge involves giving very tiny amounts of the suspect food and gradually increasing the amount given until normal portions are reached, or you react. Please book an early morning appointment for an oral challenge and be prepared to spend a full day in the clinic if necessary – bring a good book because it involves a lot of waiting around. The best way to determine whether food is contributing to your symptoms is by formal dietary investigation. This requires an exclusion phase in which all the usual suspects are omitted from the diet and only relatively safe foods are consumed. The first stage diet lasts for about 7-14 days depending on the condition under investigation. If symptoms resolve completely whilst on the diet you can safely assume that something in your original diet was causing trouble. Stages 2 and 3 involve the re-introduction of omitted foods in specific sequence. The entire process should be complete within 6 weeks. Sometimes we react to things we touch, such as cosmetics, metals (nickel), rubber, etc. These allergies are diagnosed by patch test: allergens are applied under a sticky tape on your back and left in place for 48 hours. They are removed and the test is read. A second reading is required after a further 48-96 hours.